Saving energy is a goal that is worthy of worldwide attention and international cooperation. However, it is also something that can be pursued on a local and individual level, by homeowners and apartment residents alike. Energy-saving techniques at home don't have to be expensive, either. Cutting down one's energy usage comes down to a combination of high-tech innovations, simple common-sense techniques, and basic changes in one's habits. Energy-saving techniques, overall, can be of benefit not only in the form of lower electric bills, but also less pollution of the air and water. When developing a plan to conserve energy in the home, the first thing that a resident should do is identify the biggest sources of energy usage. Typically the largest amount of energy, nearly thirty percent, is dedicated toward heating a home. The next largest, at over fifteen percent, is cooling, followed closely by the water heater and household appliances. The next step is to figure out where energy is being used when it doesn't need to be. Reducing the amount of wasted electricity is an essential part of saving energy in the home. Typically the biggest sources of wasted energy include the heating and air conditioning system, as well as lights and consumer electronics on standby power. Conserving energy can be achieved by either high-tech means or by basic changes in one's behavior. One high-tech way to measure a home's energy usage is to use a device called a watt-hour meter. It is an electronic device that sits between a device's power plug and an individual wall outlet, and measure the device's power usage over time. A watt-hour meter is useful for pinpointing problem areas within the home where energy usage is either unexpected, excessive, or both. Replacing aging or broken appliances with Energy Star-compliant appliances will also reduce a house's energy usage. Installing solar heating will take some of the workload off a water heater, and letting in sunlight during the day will reduce the need for daytime lighting. Low-tech ways of cutting energy usage and waste are also helpful when a meter is unavailable. Locating devices that are on standby power and turning them off, is a big way to save energy. Video game consoles and set-top boxes such as digital video recorders and cable TV receivers, are among the biggest users of standby power. Appliances like refrigerators can waste energy, especially if their motors are constantly running. Refrigerators with old door seals will run constantly in order to keep their contents cool, resulting in excessive usage of electricity. Replacing these seals can save energy, as will keeping refrigerators and freezers full. Turning off lights in rooms where they're not being used, is another good way to save energy. 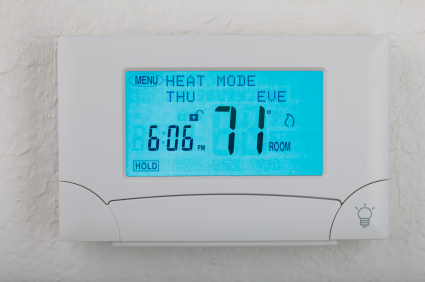 One of the biggest ways to cut down on waste is to set the thermostat lower during the winter and higher during the summer, so that the system isn't running as often. Conserving energy is as important as finding new sources of energy. Although government and scientists make efforts to find alternative ways to supply energy, regular people should do their part. This means taking steps within their own homes to conserve and reduce the amount of energy that they consume. A home that focuses on energy efficiency can use up to forty percent less energy than average. By reducing energy usage, people also receive the additional benefits of saving money as well. For more information about saving energy in the home, please see the following links. Alliance to Save Energy: Top 10 Home Energy Efficiency Tips: On this page readers will find a numbered list of the ten top home energy tips. The article also states how much money the average household spends on energy yearly. US Department of Energy: Energy Saver: This link takes the reader to the landing page for Energy.gov's Energy Saver website. On this page readers can browse and click on tips or articles on how to save on electricity or heating and cooling. Readers will also links to tools that will help save money and energy, such as calculators. US Environmental Protection Agency: Energy Advice for Owners of Older and Historic Homes: This page provides advice on how owners of older homes can save money. Tips are given on how to improve the home's energy efficiency and also how to improve efficiency by maximizing the home's original features. Energy Star: Save Energy at Home: Information on heating and cooling systems and how people can make changes to cut energy usage. Features a graph that illustrates what consumes the most and the least energy. World Wildlife Federation: Energy Efficiency In The Home And Office: An article that explains steps that people can take to cut energy consumption. Most steps are simple, such as unplugging devices. The article also discusses weatherizing the home and office. National Renewable Energy Laboratory: Solar Energy: An introduction to solar energy as an energy alternative. The page begins with a simple definition of solar energy. The page lists various solar energy technologies, such as passive solar technology, a brief explanation, and includes links to further information on each. Oracle Thinkquest: What You Can Do At Home to Save Electricity: Energy saving tips for the entire year. This page starts off with basic tips. It also includes a section on summer saving tips and winter tips. U.S. Energy Information Administration: How Much Electricity Is Used For Lighting In The United States? : This is the answer page that explains how much electricity is used for lighting purposes. The answer is for both commercial and residential lighting. Lawrence Berkeley National Laboratory: Standby Power Frequently Asked Questions: This is a frequently asked questions page that addresses questions regarding standby power, which is also known as vampire power. The page also tells the reader how to eliminate or reduce energy waste from standby power. Colorado State University: Energy Conservation In The Home: Energy conservation facts and advice. Heating and cooling tips are listed. Reducing major appliance energy usage is also discussed. California Government / Energy Quest: Saving Energy: Energy saving advice given for various parts of the house such as bedrooms and kitchens. Outside energy use is also discussed.